Weburg Apartments is a Medium-Wealth Residential Building that grows on both Medium Density and High Density Residential zones. 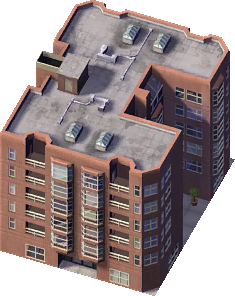 This building is one of the many in the game named after a member of SimCity 4's production team. It has been confirmed that it is named after Wren Weburg, One of SimCity 4's Website Engineers and the original Administrator of sc3000.com and sc4ever.com. ↑ SimCity 4 Credits: "Website Engineer: Wren Weburg"
↑ SimCity 4 Rush Hour Credits: "Website Engineer: Wren Weburg"
This page was last modified on 8 June 2014, at 13:55.